Jammy Furniture Mod for Minecraft is a versatile mod which adds almost every accessory/furniture which is needed for a house. 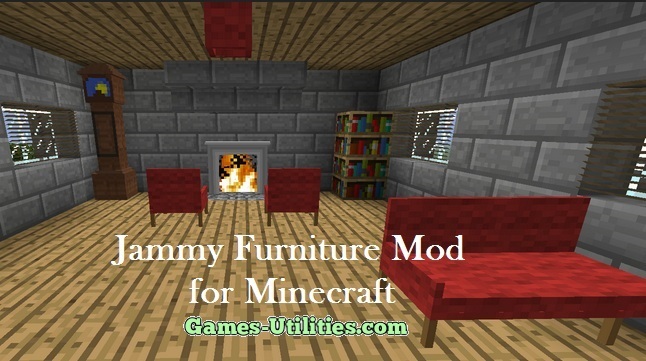 Jammy Furniture Mod helps you to build a dream home for Minecraft fans along with the furnishing of it. There are many types of Sofas, Arm Chair, Beds and many household things which can be seen in this mod. So check it out yourself. Description: A custom household mod for minecraft. Arm Chair: Allows the player to sit down. Basket: A basket for pets. Bathroom Cupboard: A cupboard that stores up to 8 items. Bathroom Sink: Allows the player to get water from the sink. Bath: Allows the player to sit in the bath. Blaze Head: A head that makes a noise when you right click it. Blinds: Right click to open, and pull up. Chair: Allows the player to sit down. Chicken Head: A head that makes a noise when you right click it. Chimney: A simple chimney that smokes. Christmas Tree: A little late, but ho ho ho! Clock Base: Part of the grandfather clock. Clock Middle: Allows the player to store up to 6 items in it. Clock Top: Right click to tell the time. Coffee Table: A simple coffee table. Cooker: Can cook two items of food at the same time. Note: It cannot cook ores. Cow Head: A head that makes a noise when you right click it. Crafting Side: Crafting Area on one end. Creeper Head: A head that makes a noise when you right click it. Enderdragon Head: A head that makes a noise when you right click it. Enderman Head: A head that makes a noise when you right click it. Freezer: Allows the player to store up to 9 items in it. Fridge: Allows the player to store up to 9 items in it. Blind Part: Needed to build the blinds. Ceramic Panel: Needed to build ceramic blocks. Light Bulb: Needed to build the light blocks. Mantle Piece (Unf): Put this in a furnace to get the final product! Ceramic Panel (Unf): Put this in a furnace to get the final product! Washing Machine: Drum Used to build the washing machine. Kitchen Cupboard (Shelf): Allows the player to store up to 8 items. Kitchen Side A: simple kitchen side. Kitchen Sink: Right click with an empty bucket to fill it with water. Lamp: Right click to turn the light on and off. Light: Right click to turn the light on and off. Mantle: Piece A simple mantle piece. Radio: Right click to make a static noise. Rubbish Bin: Put items you don’t want in here, every 5 minutes its emptied so make sure you don’t put your valuables in it. Sheep Head: A head that makes a noise when you right click it. Skeleton Head: A head that makes a noise when you right click it. Slime Head: A head that makes a noise when you right click it. Sofa Part: (Corner) Allows the player to sit down. Steve Head: A head that makes a noise when you right click it. Table Lamp: Right click to turn the light on and off. Toilet: Allows the player to sit down. Washing Machine: The washing machine can repair broken armour, add coal for the fuel. Wolf Head: A head that makes a noise when you right click it. Zombie Head: A head that makes a noise when you right click it. Download and install the latest build of Minecraft Forge according to your Minecraft version. Run Minecraft once. Download Jammy Furniture mod zip file from the link above. You should see a “mods” folder (automatically generated by Forge), open it. Put the Mod zip file there, do not extract it. We hope that this mod will rock your Minecraft. Have fun and keep coming here to check the latest updates of your favorite game online.